Francis Jehl went to work for Thomas Edison at his Menlo Park laboratory in February, 1879. Beginning in 1937, he wrote a three volume book describing his work under Edison and life in Menlo Park during the Edison years. Menlo Park Reminiscences, by Francis Jehl, written in Edison's restored Menlo Park laboratory, was published by the Edison Institute, Dearborn, Michigan (Copyright 1937-1941). FRANCIS JEHL, one of the early Menlo Park 'boys,' was stricken on Saturday, February 8, and passed away the following day. The end came at St. Petersburg, Florida, where he had gone earlier in the winter in the hope of regaining his health following many months of illness. Funeral services were held at Holcomb Funeral Home, Flemington, New Jersey, February 15. Interment was at Prospect Hill Cemetery, Flemington. Mr. Jehl is survived by his wife; a son, Fred Jehl, of Budapest, Hungary, and a sister, Mrs. Ernest Lallear, of Brooklyn, New York. Born September 6, 1860 at 1329 Chisholm Street, New York City, Francis Jehl while in his teens entered the employ of a law firm and it was through the instrumentality of one of its partners, Grosvenor P. Lowrey, that he was later to secure his chance with Edison. Study at Cooper Union and a year spent in the Phelps Western Union shop gave the youth an urge to go further in the electrical field and so it was that on February 28, 1879, Mr. Lowrey, prominent in the early days of the Edison electric light, penned a letter to Mr. Edison (still intact in the Edison records) in which an opportunity was sought for the ambitious youngster among the inventor's growing group of assistants. 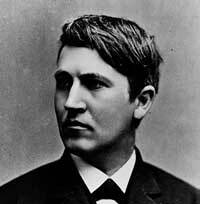 Thus in the fore part of 1879 the name of Francis Jehl was added to the Edison pay roll at Menlo Park. He was one of the laboratory assistants during the history- making days of the incandescent lamp and the development of a complete system of generation and distribution of electricity. From Menlo Park Jehl moved on to New York where, at the Goerck Street Edison Machine Works, he set up and supervised a testing room. Three years later, almost to the day on which Lowrey wrote his letter of introduction, Mr. Edison assigned Jehl to a European trip in the interest of the Edison system of electric lighting. More than forty years were to elapse before Mr. Jehl was to return home. From 1882 to 1897 Mr. Jehl went about Europe introducing the Edison system. During this period he assisted in getting the works under way of the French Edison company. Just prior to this Jehl had installed a meter department at the English Edison company plant at Holborn Viaduct, which had but lately been completed by Edward H. Johnson, general manager, and William J. Hammer, chief engineer. Among the prominent installations of that time was the plant installed for lighting the famed Brunn Theater in Austria. Other similar installations made under Mr. Jehl's supervision included that at Bucharest, Rumania. In 1883 Jehl opened an Edison exhibit at the Vienna Electrical Exposition. At one time he was associated with the Hardtmuth Carbon Company of Austria, following which he was for about seventeen years chief engineer of the Budapest company. Stranded in Europe at the close of the World War, Mr. Jehl finally returned to the United States in 1922. For a time thereafter he assisted in the collection of Edisonia, most of which was later to form an important part of The Edison Institute at Dearborn, Michigan. When Henry Ford recreated the Menlo Park atmosphere in his Greenfield Village he engaged Jehl to supervise the reconstruction of the old laboratory and to become curator of the Edison collection, which post he retained until his death. Francis Jehl was an esteemed Member of EDISON PIONEERS. Last updated by Jim Halpin on 6/29/99.